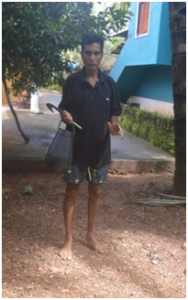 Agassaim the village in tiswaddi taluka in Goa is very well known for pork sausages, brinjals/egg tree vegetable and sweet potatoes. It is fifteen kms from the city of Panjim. Agassaim is much more as we explore it for you’ll. 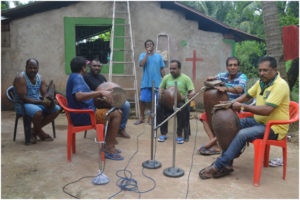 Our guides welcome you with tradition way with some goan music. A brief history is told by our guide of the cave/tunnel existing just down the St. Lawrence church wherein the other end of the tunnel is believed to be in the neighboring Siridao village were also a cave /tunnel exists. A little walk down we visit our friend Antonio Fernandes, a toddy tapper who explains and demonstrate us the process of toddy tapping work. 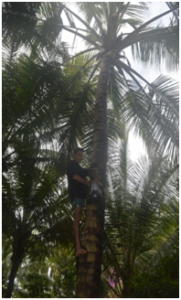 And offers you fresh toddy just brought down from the coconut tree. Then its tea time at the bolcaõ – a balcony of old goan Portuguese architecture house of Mr. Vales were in the traditional treat of ‘allebele’ (pen cake) is explained cooked and is served. You can also try to make one. After this you are taken to the place for which Agassaim is known for – the making of pork sausages. 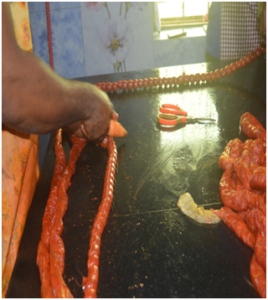 It is interesting to hear our guide who is from the same village explaining the whole processes of sausage making – from the getting a pig, masala, feeling. Tying, drying, smoking and packing. 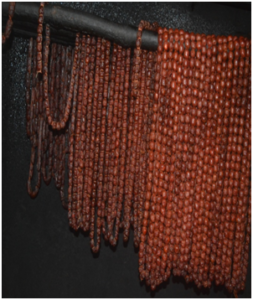 The guide also explains – how and why Goa is known for pork sausage all through the world. A short visit to the village lake is done where you can watch some migrant birds coming. 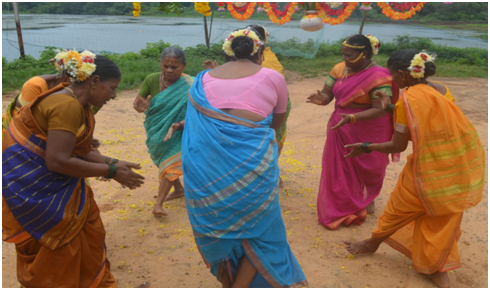 Then we have the fugddi/dhallo – a traditional dance to entertain you’ll. It’s nice to see our women dressed in their traditional share called kapodd with flowers on their heads and wearing traditional jewelry, with the tickling sound of the pizonnam as they dance and sing. The same fugddi/dhallo dance is done for the village annual temple feast. It’s nice to see the old women dance and sing for such a long time. You’ll can also take part in the dancing. 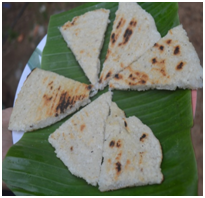 For lunch we serve traditional Goan food. Rice which is locally cultivated, curry, fish with stuffed reciad masala, Pork sausages, brinjal/egg vegetable which is locally grown and salt fish salad is served. 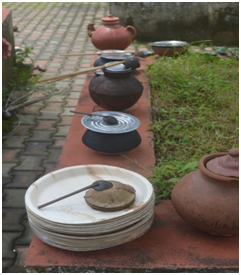 All food is served traditionally in earthen vessels. 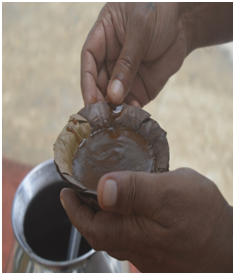 As desert tradition onn is served – the age old delicacy of Goa. The lunch place is a open space under the shadow of coconut tree. Our guide entertains you with goan music and songs strumming the guitar and gumot. After the traditional food we walk down the zuari river for the scenic view under the zuari bridge which links North Goa to South Goa. Our guide explains the traditional fishing method called arry fishing. We go down further to the north side of the village where our guide tells the history of Goas first port as we view the remains of the port. Kube – the shell fish removing art is also explained. A visit to spiritual center of Pilar Fathers – the meditation center is made and explained. Finally in the evening we take you to the south side of the village where our brothers enertain you with their Goan songs and beating of the gumot and mandonn. The same is done on the night of the wedding reception traditionally. 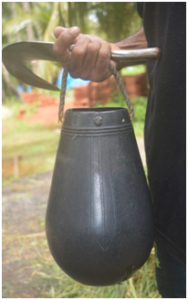 Goan tradition , culture is highlighted. They sing, they play passonaely they whistle. 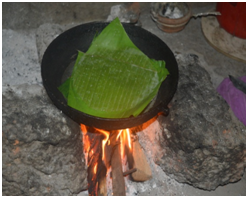 As they sing and entertain – black tea with the flovers of lemon grass and ginger is served with foleavoili bakri – local evening snack prepared in traditional way on fire wood, in a babana leaf.